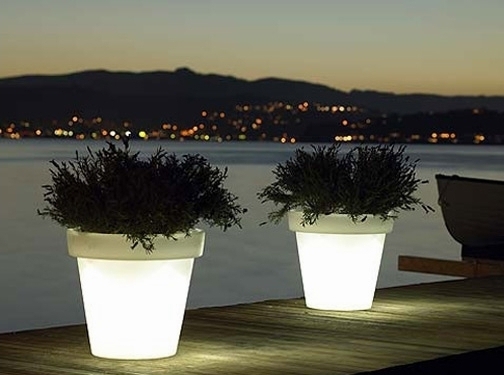 Make your gardens a talking point by using illuminated pots for your planting. A beautifully presented garden, patio or lobby sends a very powerful message in relation to quality, environment and you, no matter what your business sector is or your private home. Our items look fantastic internally or externally and are safe to use for both. The pots combine garden lighting with planting. Use them as flowerpots, storage, Christmas tree holders or Champagne chillers - the possibilities are endless. The lit furniture adds an element of fun and light to make your business shine in a competitive market! 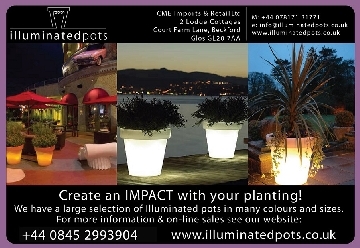 UK (Beckford) based business providing illuminated plantpots for sale. Website includes e-commerce facilities, client list, photo gallery, full contact details.